Universal Cartridge™ refills are designed for our Aroma Beam non-HVAC air diffuser system and are specifically designed to control odors while also ambient scenting in large indoor areas. 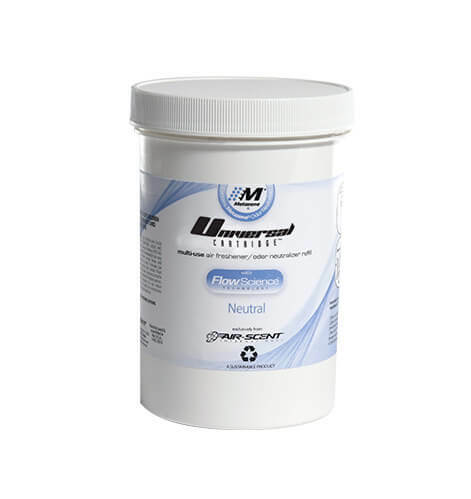 Perfect for scent marketing and scent branding applications, Universal Cartridge™ refills provide prescription odor control through the application of advanced FlowScience Technology™. Speak with our team today to oder a refill, or to learn more about Air-Scent vast array of air freshening systems. Clean citrus – best for ammonia-related odors, urine and uric acid-related odors, kitchen odors, storage cabinets [like bowling shoe storage areas] and more. Open Universal Cartridge refill canister by twisting of the lid. Open Scent Beam Q.T. using instructions provided with the unit. Place the refill canister in the unit facing the open end toward the internal fan unit.